If you're interested in DIY wedding projects, my guess is that you have two goals in mind: creating a custom look and saving cash. Well, this project can help you achieve both of those aims. One way to save money is to create multi-purpose items that not only contribute to your wedding décor but also fulfill some other purpose. In this case, we're making flower pens that can come in handy for bridal shower games or your wedding guest book and later become take-home favors for your guests. Depending on your budget and your style, you can make them fairly simple or add embellishments for more pizzazz. 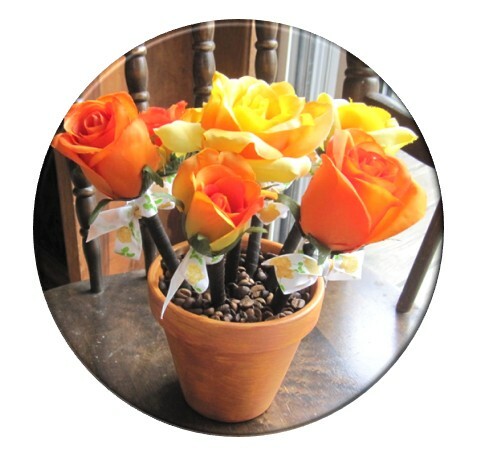 While stems with multiple buds are certainly more affordable than those with single blooms, you'll want to make sure each flower will work individually, as you will want to use only one flower per pen. Check to make sure the flowers do not easily pop off the stems, as you'll need at least an inch or so of stem to work with so the flower doesn't easily pop off the pen. Pay attention to the size. If you want a whimsical look, brightly colored oversized gerbera daisies may make sense, but if you're going more formal, too big flowers could clash with your style. Once you've chosen your flowers, you'll want to use wire cutters to clip off each flower, leaving 1-2" of stem attached to each bud. Pinch the stem against the end of the pen with one hand, along with the start of the floral tape. Circle the pen a few times, going down the shaft an inch or so, and then back up. Once the stem stays in place, the wrapping will get easier. Continue wrapping down the shaft of the pen, until you get to the part where it narrows to the point, making sure not to leave any areas uncovered. Then cut the floral tape, at an angle, and press the loose end against the wrapped pen. The tape should be tacky enough to remain in place, but if you're worried, a dab of adhesive certainly won't hurt. Once you're finished, you can embellish your pens, as you wish. 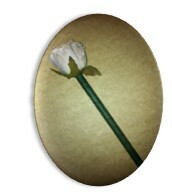 Mine have a ribbon tied around the base of the flower and I used this to attach a velum envelope to each one. Inside the envelope I had a table card for each guest, having the names on one side and the table number on the other. 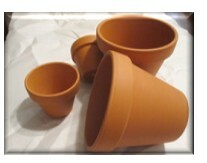 If you're opting for the painted pots see Step 4 below. If you want a more formal look I'd recommend one of these three changes or additions to your supply list: metallic paint, a clear glaze, or patio paints which provide more thorough coverage than typical acrylics. You can use paper plates or disposable plastic containers like I did here. I started with a matte buttercup yellow. Notice that I painted the top couple inches of the insides. Since the color I was using was so much lighter than the clay, I needed to apply at least two coats. Because I planned to paint over it, I stopped with two; otherwise, I would have gone to three. If you're doing at least 3 pots, by the time you finish with the third the first one will probably be dry enough for a second coat. For a more casual look, I might have painted stripes or polka dots, but instead I took a slightly different approach. 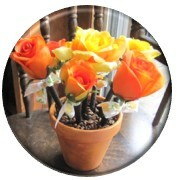 I wanted to try to match the apricot and buttercup colored roses that I used while keeping an elegant look, so I used an antiquing technique. With latex paints on larger surfaces you need to add glaze to the top color because they dry so quickly. However, I found that with acrylic paints on such small items I was not fighting the clock on drying time. I simply spread the darker color, metallic copper, over the yellow being sure not to cover it completely. Some call this a shabby chic look. For the small pots I went a different direction, using only the metallic bronze paint. Since that color was so close to that of the natural clay, I didn't need to do a second coat. If you want to dress up the pots just a bit by making them metallic, I'd highly recommend metallic bronze! Once your pots are dry, you simply need to tape stickers or cardboard inside the bottoms to cover the drain hole and then fill the pot. Coffee beans are my favorite filler, both for their dirt-like look and for their fragrance. Since they're a little pricey I've used dried kidney beans to fill the first few inches and then coffee beans on top. One 4 pot looks great with just 3 pens, but up to 8 will fit quite nicely too. At a shower you could use these as centerpieces allowing each guest to take one pen home, or marking one of their plates as the winner who gets to claim the entire pot. 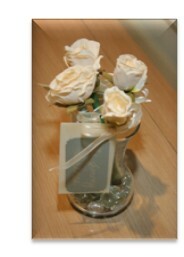 Another option is to give out small pots with one pen in each as favors, which can be part of each place setting. By using multi-purpose DIY projects like this one, you're sure to save money on your wedding, while still walking down the aisle with style! Tammy Wagner is currently a stay-at-home wife and mommy to two little boys. During naptimes and after bedtimes, she does some freelance writing, blogging, and crafting. She also loves to use her talents to serve the Lord and plan weddings and other special events for family and friends. You can contact her or read more through her blog, www.tammymommy.blogspot.com. She also writes as Tammy Mommy at www.goodblogs.com.